Is Egypt facing a real-estate bubble? “Egypt’s real-estate market is witnessing a slow-down, not the end of a bubble,” Hisham Shoukri, chairman of the Roaya Group for Real Estate Investment, told Al-Ahram Weekly recently, adding that the country has experienced various ups and downs in the property market over the past 30 years. Traditionally, a housing bubble is an escalation of real-estate prices driven by increased demand, limited supply and possible speculation that eventually bursts causing prices to fall. The US saw the bursting of a real-estate bubble in 2008 when mortgages represented 98.8 per cent of all the purchases in the country’s real-estate market. Millions of US homeowners then suddenly owed more on their properties than they could expect to sell them for, and they swiftly got into difficulties on their loans. “Mortgage financing in Egypt makes up barely three per cent of purchase operations. This makes Egypt safe from a real-estate bubble,” Tarek Shoukri, chairman of the Real Estate Development Chamber at the Federation of Egyptian Industries and head of Arabiya Group for Real Estate Investment, told the Weekly. Demand is high in the real-estate market in Egypt, however. In particular, somewhere between 900,000 and one million marriages take place in the country annually, and scores of newly-weds buy new residences. “For a real-estate bubble to occur, supply has to outstrip demand, which is not the case in Egypt,” said the head of Roaya. Purchases in the Egyptian real-estate market are mostly paid for in cash, not credit, said a study published last week by the Egyptian Centre for Economic Studies (ECES). This being the case, a real-estate bubble is highly unlikely, the report added. Alaa Fekri, chairman of Beta Egypt for Real Estate Investment, concurred. “What we are witnessing is a slow-down in the market. There is not, and there will not be, a real-estate bubble,” he said. Since mid-2017, a few months after the floatation of the Egyptian pound in November 2016, people’s purchasing power had decreased with the depreciation of the pound, Arabiya’s chairman said, adding that while many people still wanted to buy housing units those on the market did not suit many people’s purchasing power. A real-estate bubble would mean a continual rise in the price of units to exceed their real value in the market, said the ECES report. It observed increasing demand for small units, coupled with payment problems on the part of individuals because of present economic conditions. Consequently, units available for purchasing had increased and their prices had risen, the report said. The secondary market had seen a slow-down, and selling had become limited to the primary market. The ECES report criticised the government’s venture into the real-estate market and its inclination to build and sell fully-finished units to higher-income groups. The state’s experience of real estate in the new cities was not encouraging, the report said, and occupation rates in these remained less than what was targeted. “The real-estate market needs better organisation,” Fekri said, who also criticised the state for venturing into real-estate development. “It’s easy to enter the market, but it is difficult to get out of it,” he added. The ECES study said that 25 per cent of the units built by the state in the new cities had not been sold, something that had started when the price of land increased in 2004 at Urban Communities Authority auctions. Land put up for auction in New Cairo and 6 October city went up by 130 per cent. The government’s real-estate tax, the report explained, would have a positive impact in the long run, limiting the number of units being held for sale at a premium in the future. The tax would, however, have a negative effect in the short term, with an increase of units offered for sale on the secondary market. Some 16.2 per cent of the country’s GDP comes from the real-estate sector, something which the ECES study says is too high. It points out that construction-sector and real-estate activities rose by 225 per cent and 952 per cent, respectively, between 2010-11 and 2016-17. 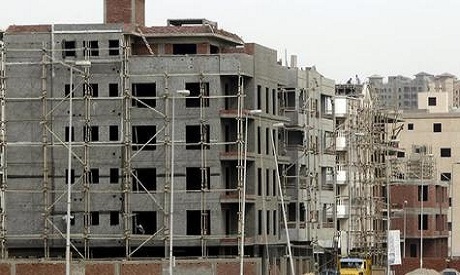 The report said it was worrying for Egypt’s economic development to depend so much on the real-estate sector, since any crisis could boomerang on related activities. Real-estate company owners say some companies are not serious about their advertised projects, and that there are bodies, represented by housing associations, that are conducting sporadic construction operations not in line with market regulations. These could also lead to an imbalance in the market. “Parliament has received huge numbers of complaints from people who bought units from developers who didn’t commit to the delivery dates. Some of these people live abroad,” said Sahar Atman, a member of the parliament’s Housing Committee. “Some real-estate companies are not serious either, offering units at prices and conditions not matching market regulations. They sell units on 15-year instalments and 10 per cent down-payments. Some of them offer units without any down-payment. Any serious developer that cares about its reputation and delivering according to a scheduled deadline will not make these offers,” said Hussein Sabbour, head of the Al-Ahly Company for Real Estate Development. “There is one company that is offering units in a new area on 15-year instalments, whereas the state has demanded it hand over the units within four years. This is a huge cost shouldered by the company for no return. No serious company could make such an offer,” Sabbour added. A law to curb infractions in the real-estate market, such as not meeting delivery dates, is needed, observers said. However, such infractions should be reduced once the real-estate development bill, now in discussion in parliament, goes into effect. “The aim of the bill is to monitor closely the sector’s activities and bring violations to a halt. But discussions of the bill in the parliament have also come to a halt,” said Mohamed Abdel-Ghani, a member of the Housing Committee, citing “the committee’s insistence on putting into effect regulations on credit ceilings for companies according to their experience and the date of their establishment” as the reason for the delay. “The regulations discussed included forbidding advertisements for any project unless it had obtained a licence from the party from which it acquired the land, which means that the price of the land has to be fully paid in advance,” added Abdel-Ghani. He criticised the state’s involvement as an investor that constructs and sells housing units, saying that this had led to an increase in the price of units. The price of a square metre had increased in Al-Tagammu Al-Khamis from LE7,000 to LE9,000 when the government had developed its “Dar Masr” units, he said. A square metre in the villas area of Alamein City, developed by the private sector, had used to cost LE12,000 to LE15,000. Now it ranged from between LE25,000 and LE27,000 following the government’s announcement of units to be sold at Alamein Towers where a square metre cost LE40,000, he said. *A version of this article appears in print in the 27 September 2018 edition of Al-Ahram Weekly under the headline: No real-estate bubble?